MSV: Beth Mason, dessert hostess with the mostest? Beth Mason, dessert hostess with the mostest? Beth Mason is in Atlantic City and hostess to a Gov. Christie ally's event with statewide pull. The dessert affair hosted by Mason at the League of Municipalities featured a photo with the influential state senator, Steve Sweeney, the event's featured politco. The Mason family has donated tens of thousands of dollars to NJ Democratic pols, mostly in northern NJ but has not been able to gain traction purchasing anything beyond a council ward seat in Hoboken. All told, it's estimated the Mason family has spent $2,000,000 on her "political career." Councilwoman Beth Mason, dessert hostess for NJ State Senator Steve Sweeney in Atlantic City. Her "bidding war" for Assemblyman Ruben Ramos' seat with Frank "Pupie" Raia landed up with neither getting the nod from State Senator and Union City Mayor Brian Stack. The rumored seven figure bidding brouhaha for the legislative seat paying 49K annually was rolled into a "Vision for Hoboken" plan. The controversial redevelopment Vision 20/20 was presented in a concept brochure and expected to more than double the size of the existing downtown Hoboken Housing Authority. That "Vision for Hoboken" feature was thought to see millions cleared and delivered via Executive Director Carmelo Garcia's pushing it through City Hall. Beth Mason looks to be positioning herself with another faction of NJ Democrats in an attempt to buy influence and an exit visa out of Hoboken. Her prop for mayor, Timmy Occhipinti failed to get her in the back door of City Hall into the mayor's office. Her long time political operative FinBoy burned Old Guard bridges with a flyer posted around town before the election depicting Ruben Ramos and his council slate with convicted felon and ex-mayor Anthony Russo describing the former mayor as a "criminal." 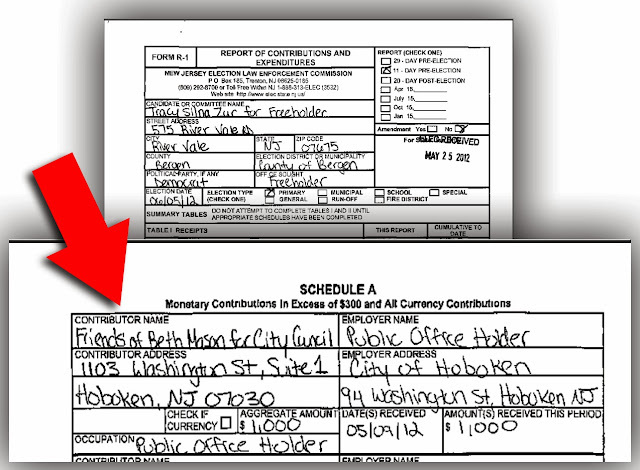 Among the tens of thousands the Mason family has donated to north Jersey pols, she gave at least four figures directly herself to the campaign of former Hoboken municipal prosecutor Tracy Zur in 2012 with tens of thousands given on behalf of her freeholder campaign wheeled through the Bergen County Democratic organization. Zur sought and was elected to the position of Bergen County Freeholder later that year. County Dems ran into the tens of thousands. It was the only race in Bergen County in 2012. Talking Ed Note: Tracy Zur was the municipal prosecutor in Hoboken in a change of venue hearing back in July 2012 where Beth Mason political operative and fourth ward Democratic Committeeman Matt Calicchio filed charges against MSV claiming he was being followed. The case was recently thrown out of court in Jersey City. Zur's bad behavior at that 2012 hearing is another story but she cashed at least part of Mason's money into her campaign account within days of the first Hoboken hearing that May. Zur sought but was not renewed Hoboken Municipal Prosecutor for 2013. The Jersey City Municipal Prosecutor was shown the transcripts of Matt Calicchio lying up and down on the stand in Union City when he was the defendant in a harassment case against a sitting BoE trustee and her five year old daughter outside her school.